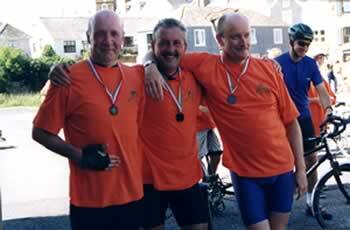 Whew, glad that's done for another year, say the boys at the finish of the 2nd Nello Century Cycle Challenge, July 1st, 2001. Now where's the beer? The scenes on Topsham Quay as the 150-plus cyclists made their way to the finish, having completed the challenging 100 mile course over the roof of Exmoor and back, were truly extraordinary and even moving. Some cyclists were clearly elated and overjoyed at what they had achieved; others were close to collapse, totally exhausted from the hundred mile pedal; a few broke into tears, a mixture of relief, pain, exhaustion and exhilaration. Bicycles of every type, size and colour were everywhere and cyclists milled around the Quay, enjoying a drink, proudly wearing this year's bright orange tee-shirt and medal (decorated by hand with Italian ribbons and pasta, of course). Whenever a new rider arrived, individually or in a group, there were huge cheers from the assembled throng. It was hectic, joyous, and, for us, hugely satisfying to see how much this event clearly meant to those who took the Nello Challenge. Cycling 100 miles in a day is no easy feat, so well done everybody! In the evening, over 300 people  cyclists, family, friends, and helpers  gathered at the Topsham Rugby Club to celebrate with a feast in true Nello style and spirit. An incredible and abundant spread of foods was prepared by a team of very special people, including David and Ondine Kearley; Paul and Katherine Russell; Michael Caines; food writer friends Rosie Barron, Christine McFadden and Liz Franklin who all came down specially for the event; Mariangela and Paola; and many others. Much of the food was donated by local businesses, including Arthurs, Darts Farm, Highfield, and Richards. For the second year running, Mario Fontana, our Italian winemaker friend who used to supply Nello with his outstanding house Barbera, drove all the way over from his home in the Barolo wine hills to bring over wines for the evening, an extraordinary gesture of friendship in memory of Nello. The sun shone, and it was a truly special day which many will never forget. This was the second year that we've organised the Nello Century Cycle Challenge, with all monies raised in aid of local cancer charities in association with FORCE. Last year's efforts resulted in more than £10,000 to this very worthwhile organisation, and it is our hope that we will at least be able to match this sum, depending of course on the generosity of those who are sponsoring the cyclists. Nello and I were very proud to be associated with FORCE when we first launched Ride for Life in 1997 for our cycle from Topsham to Venice. FORCE is a truly great local organisation, indeed a true force of positive lifegiving energy within our community. For me, and for many others, this event is not just about fundraising, important though that element is. Through this day, we honour and remember a wonderful friend whose spirit remains very much alive within our community. And through participating in this event  both for those who knew and loved Nello, as well as for those who never even knew him personally but in some way do now  we can all draw positive lifegiving energy and strength from Nellos indominable and tireless spirit. That to me is what makes the day so very special. Indeed for those who took part in this year's Nello Challenge  the children who went as far as Bolham, a huge achievement in itself; and all the cyclists who struggled up that long hill from Dulverton to the top of the moor, who endured the interminable (but lovely!) stretch from South Molton to Copplestone, and who suffered those savage, sharp rises at Newton St. Cyres and en route back through Exeter to Topsham Quay  the long hours spent in the saddle, in pleasure or in pain, to complete (or perhaps even not to complete) the hundred mile circuit, were a powerful celebration of our human capacity to meet challenges, to grit in and endure, to achieve personal and collective goals: in short, simply to be alive. We'd love this event to be able to continue in future years. At the moment, weve hardly had time to draw breath, and it is difficult to look that far ahead. This event has clearly caught the imagination of our whole community and even beyond. It seems likely, should it happen again, that next year even more people may wish to participate. In that case, it is difficult to see how it can remain in its present form, and we are currently canvasing opinions on how and in what form it might evolve. Over the coming months, we'd be very happy to hear your constructive ideas as well as offers to get seriously involved, both from cyclists and non-cyclists as well. Please call Marc or Kim on 873778 or email marc@rideforlife.org.uk. But in the meantime, just to say once more a huge thank you to everyone who helped in so many ways and made this such a community event: the excellent and inspirational support teams; the baking teams who made such an incredible array of goodies to sustain us en route; the support drivers and medical team; all who helped with the evening Pasta Feast; and the many local businesses who generously supported the event through donating some really brilliant prizes for our raffle. And to all the cyclists who took part, once more, Well done and thanks for joining in. Nello would be very proud.